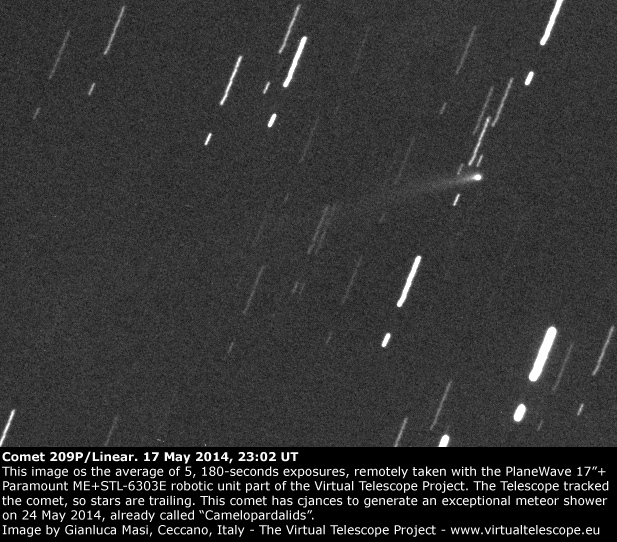 Next 24 May 2014, between 06:00 and 08:00 UT, there are chances to enjoy a memorable, exceptional meteor shower. The parent object feeding this possible event is comet 209P/Linear, a small dirty snowball now well known to the world because of this very desirable gift. Join us on May 22, starting at 20:00 UT Universal Time! You just need to access our online webTV, click here! Dr. Masi, Sorry for the clouds on May 22… instead I watched the podcast of April 21 “Stars for All”… very beautiful. Thank you for making these events available for the public. I am praying for clear skies on May 24th! From Sandy Bump in Wisconsin, USA.